Internet is distributed into domains. Not even a single bit of webspace is free from top level domains. Domain registrants actually own the internet. Domains can be bought, owned, transferred, inherited and traded into also as newest kind of private property. You too must own your part of internet by registering your domain name at system.sangkrit.net and make your people also own their domain names. Own your domain of internet and make others also own theirs to keep it growing as another universe. Moreover helping others into this might become your serious business. 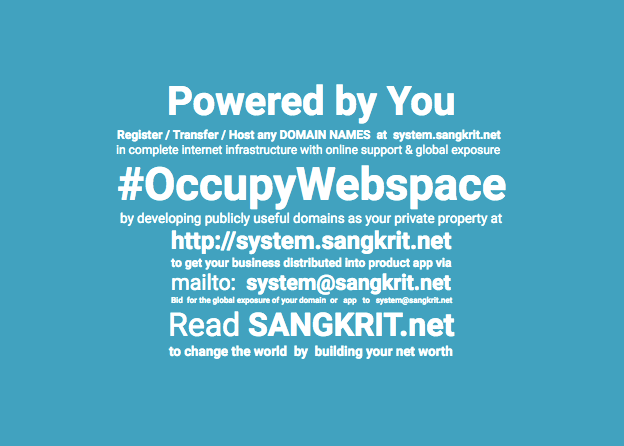 Signup for your account at Sangkrit.net to become the people’s personal outlet. You may freely work as internet growth engine.